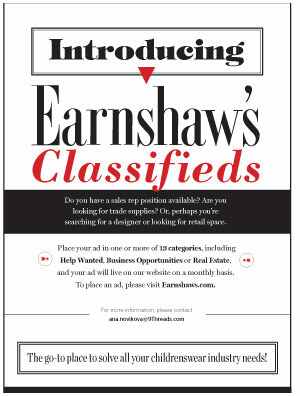 Earnshaw’s has proudly served as the voice of the children’s fashion and juvenile product industry for 101 years. Our readership includes more than 15,000 retailers and brand executives who rely on the magazine, both in print and online, to hone their retail strategies and merchandising techniques, keep their assortments fresh and stay on top of the latest trends, technology and industry news. To learn more about what we cover each month, download our media kit. For all other questions, please read our FAQ page.